The Italian 3D printer manufacturer Sharebot is the maker of SnowWhite, a commercial and low-cost laser sintering (LS) system which they say is almost ready to hit the market. The SnowWhite, when it’s not printing in sugar, uses nylon and nylon blend materials. For Italian companies, it is as difficult to establish themselves outside of the national confines as it is for foreign companies to invest in Italy. That is probably the reason why both the Inside 3D Printing and 3D Printshow circuits do not yet have a location in Italy, and why Italy is the only major country in western Europe to have its own 3D printing event circuit (3D Print Hub). 3D Printing appears to be making its way into just about every industry out there. Whether it is the construction industry, car manufacturing sector, or even the video game industry, 3D printing has already begun to make its mark. Before long it wouldn’t be surprising to see every single manufacturing firm turn to 3D printing for at least some of their production and prototyping needs. From both Italy and Sharebot comes some interesting technological literary news, as they begin to distribute author Paolo Aliverti’s book, Stampa 3D Stazione Futuro (Publisher, Hoepli, 2014) free to libraries in Italy’s major cities. Italian 3D printer manufacturer Sharebot seems to be firing on all cylinders here lately, launching new products and applications, and partnering with major companies like Arduino. By reaching out to various entities throughout the 3D printing space and launching a series of new printers and products, the company has set themselves up for major growth. 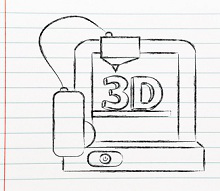 If you are relatively new to the 3D printing space, and recently purchased a 3D printer, then you may be aware of one of the issues the market currently faces when it comes to consumer level 3D printing. It’s not really all that easy to simply dive into. You need slicing software, a general understanding of the various file formats, and once the printing begins, a need to seemingly always have to stand by and make sure the print doesn’t get off track. SHAREBOX3D from Sharebot desktop 3D printer on Vimeo. Be in full control of your 3D prints from your computer, tablet or smartphone. With many of the heartwarming stories hitting the headlines regarding 3D printing, it’s easy to overlook one of the most important aspects of this innovative technology that truly does have the power to change the world: sharing. For survival, humans are naturally built to have a bit of competitive edge, but sharing and working together is even more crucial to survival — as well as the continued progression of what we consider to be a highly evolved world. Fused-filament machines are hitting their stride and resin-based printers are about to become mainstream. Meanwhile, the next generation of at-home 3D printers will use lasers, heat, or liquid to bind powders into solid materials. You can put 3D printers on the list of items with wacky European counterparts. Traveling overseas often means stepping into a world with strange but slightly familiar goods. Like tiny bubble-shaped cars with diesel engines. Fancy cellphones with dual sim-card slots. Machines that wash AND dry your clothes. PAL television standards. Odd power plugs. The list goes on and on.